All new, nothing vintage about this one! 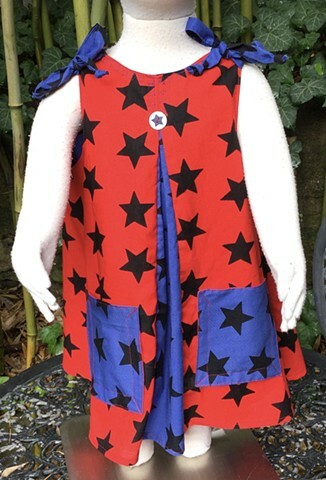 Size M for a 3-4 year old, measures 27” armhole to armhole, 18” length. Black stars on red and blue grounds, wrapping in the back with overlapping panels, closing with star buttons. Deep pleat in the front makes for more movement, bow ties at the shoulders, special decorative star stitching at front reinforces motif. $80, 100% cotton, machine washable, made by the designer herself and shipped free to any address in the U.S. #256.